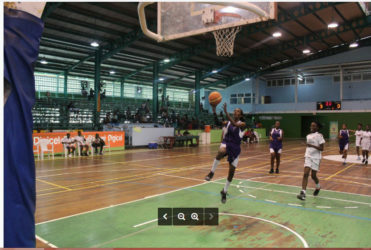 Unbeaten Bishops’ High and Marian Academy clinched semi-final places in the girls’ division while President’s College and St. Rose’s High are through to the boys’ U16 semi-finals when the National School Basketball Festival (NSBF) Georgetown and East Coast quarterfinals commenced on Sunday. Staged at the Cliff Anderson Sports Hall, the unbeaten Bishops’ High crushed St. Stanislaus 16-2 in their Girls Divisional quarterfinal matchup. Shamar Huntley of St. Rose’s High lets one fly during his 13 point effort against Marian Academy in the U19 boys’ division. 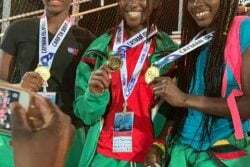 Kesann Charles scored eight points while Sileena Arjune scored four points. Jayla Jones had three steals. Marian Academy girls crushed their Queen’s College counterparts 32-0. Jada Mohan had 10 points, seven rebounds and as many steals while Jahrier Young scored six points, six rebounds and six steals. Chipping in with six points and five rebounds was Georgianna Vyphuis. In the other semi-final matchup, President’s College crushed Plaisance Secondary 27-0. Demelsa Nicholas scored 15 points, while collecting six rebounds and eight steals while Claudia Garraway scored six points and five rebounds. The final result of the section witnessed St. Rose’s High blanking Tutorial High 20-0. Aliyah Howard led the way with seven points and four steals while Jamaica Blair scored five points and grabbed three rebounds. Assisting with four points and eight steals was Jada Amerally. Bishops’ High will now oppose St. Rose’s High in the semi-final round while Marian Academy will tackle President’s College. 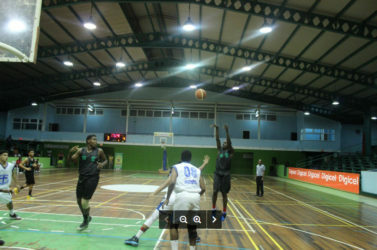 In the under-16 section, President’s College downed Plaisance Secondary 53-43. Akeem Crandon recorded a double-double of 13 rebounds and 22 rebounds for the winning team while Kareem Boyle scored 11 points and pulled down nine rebounds. There was also a 13-point effort from Gijah Persaud. For the losing team, Andrew Johnson shot his way to 22 points while Nigel Bowen registered a double-double of 10 points and 19 rebounds. On the other hand, Marian Academy blew away North Georgetown 51-16. President’s College’s Demelsa Nicholas in the process of scoring an easy layup during her side’s lopsided win over Plaisance Secondary in the girls’ division. Jordan Alphonso scored 12 points and had eight rebounds while Jahleel Young recorded 11 points and pulled in seven rebounds. For the losing team, Javroll Shepherd scored six points and seven rebounds. In the other two results of the section, St. Joseph’s High edged Bishops’ High 22-17. Denzil Ross scored 15 points while Webster McRae grabbed 10 rebounds. The final match witnessed St. Rose’s High squeaking past Bladen Hall 28-25. Kwesi Roberts had 11 points, three rebounds and four steals while Anthony Yansen had three steals. Darnell Hamer recorded a double-double of 18 points and 11 rebounds in the loss. In the boys’ under-19 section, Tutorial High defeated St. Joseph’s High 37-35. Zion Gray top scored with 10 points for the Woolford Avenue unit while Dequan Manning scored nine points and Tariq Nelson recorded six points and seven rebounds. For the losing team, Abevia Henry scored eight points and grabbed six rebounds. Similarly, St. Rose’s High downed Marian Academy 39-31. Shamar Huntley scored 13 points in the win while Leon Ross assisted with eight points and 10 rebounds alongside six points and as many rebounds for Akil Vaughn. For Marian Academy, Jordan Alphonso scored 15 points. 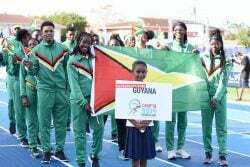 The tournament is sponsored by Digicel Guyana, Edward B. Beharry (Champion) and Company Ltd and Banks DIH Ltd., (Powerade). The Regionals will shift to the U19 and U14 quarterfinals on Saturday and Sunday while the NSBF Regionals’ semifinals and finals will be contested in all divisions on June 25th and 26th respectively.